A powerful photo series illustrates President-elect Donald Trump’s sexist comments painted on the bodies of naked women. When Donald Trump won the presidential election in November, 18-year-old Aria Watson knew she needed to do something. So, she turned to art. Watson, a first-year student at Clatsop Community College in Oregon, created a powerful photo series titled “#SignedByTrump” for a final project in a photography class. The images feature some of the sexist comments President-elect Donald Trump has made about women painted on naked women’s bodies. 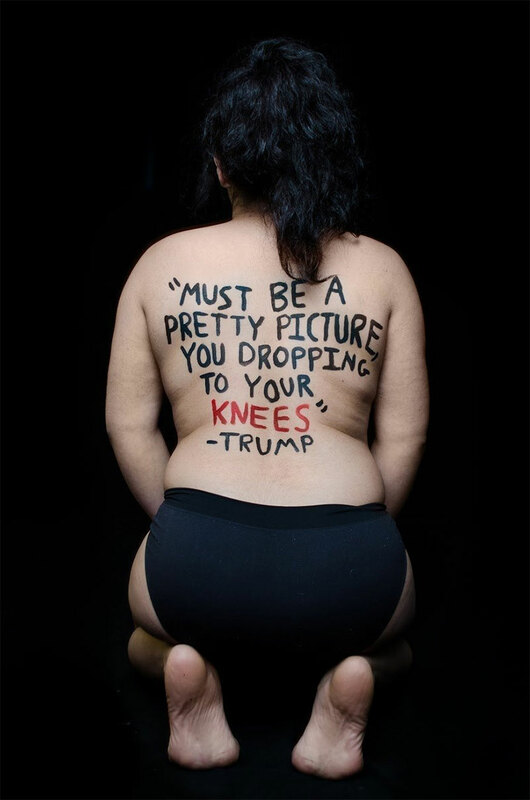 Trump’s misogynistic comments paired with these women’s naked bodies serves as a powerful commentary on the damaging effect his words have had ― and will continue to have ― on so many women. I’m scared that the way he speaks about women — this sexism and misogyny — will end up becoming a social norm. The 18-year-old, who’s also an avid YouTube vlogger, said she had a very difficult time finding women who wanted to model for the series. Watson ended up including only five women for the series, one being herself and the other four are close friends. So, how do we stand up to Trump? Continue to speak out, Watson said. Trump in an interview with Esquire in 1991. Trump remarking on a female Celebrity Apprentice contestant on the show in 2013. Trump remarking on super model Heidi Klum in an interview with the New York Times on Aug. 15, 2015. Trump referring to Megyn Kelly possibly being on her period after she called him out on his misogyny on August 7, 2015. Trump referring to women in a leaked audio conversation with “Access Hollywood” host Billy Bush in 2005. To see more of Watson’s work head over to her Tumblr, Instagram or YouTube page. The Outrage partnered with Watson to create a #SignedByTrump postcard set. At least 15 percent of the profits from each purchase will be donated to a women’s empowerment organization. Buy the postcard set here. This entry was posted on 29 November, 2017 in homepage. Bookmark the permalink.